Horror Channel is broadcasting the UK TV premiere of RADIUS. Are you a fan of the channel? Steeve: We unfortunately don’t have Horror Channel in Quebec, but from what I’ve seen from you guys, it looks awesome. I would’ve loved growing up with that on my TV! The film has a highly original premise. Where did the inspiration come from? Steeve: It was a long process, 4 years I think… At first we wanted to do something like Oldboy, with a man and a woman who realize they share a dark past; that’s where the serial killer aspect came to mind. We didn’t write much based on that alone. Then later, when the radius of death idea came to us, we decided to merge these two ideas and see if we could intertwine them together. The film carries us into deep emotional waters as well as being a cleverly-spun Sci-fi thriller. What is the underlying message you want people to take from the film? Caroline: We always wanted people to exit the movie and start asking themselves: “if your memory is erased, are you still guilty for your past crimes, can you be convicted if you truly don’t remember”? And we, as the writers, still don’t have a clear answer for this. Liam’s redemption (or at the very least, his punishment) was always something along the lines of what we have now. Our idea was that upon learning and absorbing the fact that he used to be utter scum, the good half of Liam would turn out to be stronger, and it would make him do the right thing. But again, does he truly deserve to die, now that his good half is aware and repentant? Hmm…discuss! What were the biggest challenges you faced making the film? Steeve: As with any film, big or small, the answer is: time and money. I’m sure Ryan Johnson (Star Wars) would say the same thing. 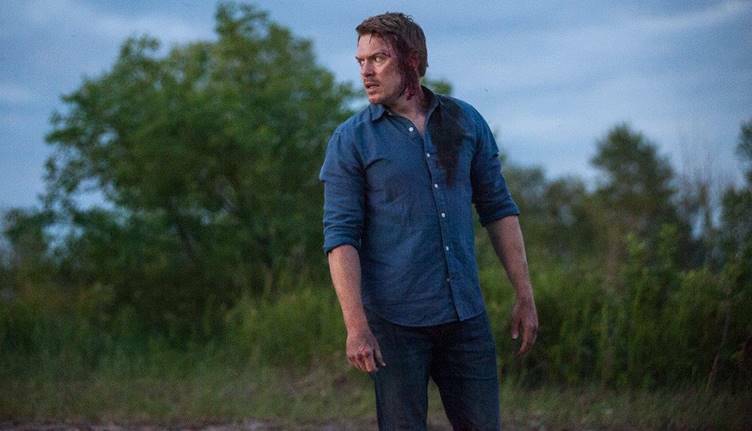 Is it true that the lead actor, Diego Klattenhoff, was only cast four days before shooting started? Caroline: Yep! So was Charlotte Sullivan (Jane). Sometimes casting just happens that way. Getting the right actors on board is a combination of timing, budget, schedule, personality, marketability, etc… And sometimes getting all of these things to click takes a while. We got our leads late in the process, but we got exactly what we needed: talented actors who took the material and made it their own. We love the work they did. There’s a funny production story about you trying to make a corpse out of a sack of potatoes. We’d like to know more! Steeve: There’s a scene in the movie where (SPOILERS Diego has to dump a wrapped up body in a pond, and, we didn’t have the necessary dummy to wrap up. Anyway, the props department had to work fast, so they told us they’d make a dummy out of 50 pound sacks of potatoes. We said okay, and they built the thing — wrapped it up in a tarp and everything, and it looked like a human body. So… on the day, we get Diego on the boat and the crew hands him this wobbly, 200 pound body, and then we get the camera ready — we had a drone above him, too, and we were pretty excited about that. So anyway, we get ready and then we tell him to drop this thing in the water on the count of three, and we were gonna do this thing where, as soon as the body starts to sink, we’d fly the drone upwards really fast, creating this cool dizzying shot. So we countdown: 1…2…3… he dumps it in and… It. Does. Not. Sink. And then it hits all of us at the same time: oh… yeah… potatoes float. I felt my soul step outside my body and slap me in the back of the head for being such a moron. Anyway, we tried to punch holes in the tarp to make it sink. We tried it again but it never really worked. So we had to move on without that shot. I made it work in the edit, but that cool dizzying shot never got made. When the film received its European Premiere at FrightFest last year it got a tremendous reception from both critics and the audience. What are your abiding memories of the event? Steeve: Obviously, the UK showings were a great treat for us. Everybody was nice and very supportive of the film. But I think the two major moments Caro and I will take away are, firstly, the moment we walked into the theatre and saw the Imax-sized screen the film was going to be shown on. At that moment, we felt very small, very undeserving, very nervous. It was like: “oh crap, how will the film look and feel on such a huge screen”? But when it started, it was also very cool, very epic to see. The second moment was at the end of the movie, when Liam pulls the trigger: I turned around and looked at the audience, and I saw a bunch of guys wiping the corners of their eyes. I turned to Caro and said: “I can’t believe it, we made English people cry! This is working!” It was a good feeling! How did you start your filmmaking career together? Steeve: Caro and I have been making films ever since we enrolled in film school. We’ve always worked together. Caro has done some side projects without me — she’s actually shooting another movie this fall. One day I fear that she’ll finally realize that I serve no purpose whatsoever in our directing duo, hahaha! How would you describe the chemistry / working relationship between you? Steeve: On set, Caro usually deals with the technical side of things, while I go and talk to the actors. Then we meet up and discuss everything, make some adjustments, and that’s about it. We do a take or two, then try some variants that either me or her have in mind. Caroline: we also like to be extra prepared. We discuss and over-analyse everything in advance, we storyboard as much as possible — we always have a shot list on hand. When we get on set, we usually have an answer for every situation. Steeve: and we never argue on set. We keep that for home, hahaha! Caroline: We’re currently working on another sci-fi thriller, this time with horror undertones. We can’t say much right now, as we’re getting ready to shop the script all over town. We also have a robot sci-fi film and a slasher film with a neat twist in the works.